How much ever hard you may try, you just can’t call the J.Springs by Seiko Sports Automatic Black Dial 100M BEB053 Men’s Watch the epitome of Japanese engineering. But then again, you can’t deny its unique design; its quality that arouses a fair bit of both intrigue and respect and most importantly, the superb value it brings to the wearer. Definitely, it’s one of those JDMs that do bit more than just sticking around through thick and thin. Not every occasion calls for flaunting a very high end timepiece. The Seiko Sports Automatic Black Dial 100M BEB053 Men’s Watch is a perfect choice for those times; you don’t even have to think for once before making it a part of your daily grind. Be it the gruelling desk job or multiple shifts in the factory; a boisterous weekend party or putting a fence around your property, the Seiko Sports Automatic Black Dial 100M BEB053 Men’s Watch shall always hold up as your reliable, time-telling companion. Besides, it looks good too. Whoever is under the notion that J.Springs is some obscure watch brand trying to make it big with some fancy name shall now be biting their respective tongues. It’s none other than the Jap-Giant Seiko disguised under a somewhat European name, the ‘J’ signifying Japan. Take it as the legendary Seiko 5 reincarnated for the younger population; the same high quality materials and cutting-edge technology under a new name, for the new slew of watch-wearers around the globe. 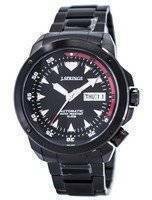 The J.Springs by Seiko Sports Automatic Black Dial 100M BEB053 Men’s Watch brings forth a distinctly different design aesthetic within a tough-as-a-nail construction. You just can’t argue regarding that; it holds from the steel used to the movement and the hardlex glass. All the tough things put together makes the J.Springs by Seiko Chronograph Black Dial 100M BEB053 Men’s watch quite a beefy piece! If you have been fancying JDM watches for sometime but was reluctant to procure one either for the high price or the plain designs, the J.Springs Automatic 21 Jewels Black Dial 100M BEB053 Men’s Watch is your chance to go for the type again. Housing an automatic Cal.Y676 (21 jewels, accuracy +45~-35 sec/day) movement with a day/date indicator, featuring a 10 Bar Water Resistance; a black, PVD stainless steel case and bracelet and an almost unbreakable Hardlex mineral glass, this one is nearly invincible, no matter how much ordeal you make it go through. Its see-through, screw-down case back is also another rarity within the price range; so is the curve on the mineral glass. To complete the pro-s of the J.Springs by Seiko Sports Automatic Black Dial 100M BEB053 Men’s Watch, it is one of the pro-grade watches under the disguise of entry-level, with an overall distinct design. This entry was posted in J.Springs Watches and tagged J.Springs Automatic 21 Jewels, J.Springs by Seiko Chronograph on December 8, 2016 by citizenwatches.